SAP Governance, Risk and Compliance (GRC) has components that can be used as individual tools primarily designed to effectively address various aspects of the governance, risk and compliance requirements of a business organization. It aims to offer component tools that are effective in providing a more comprehensive capability that are effective in managing the complete control of environment while also allowing business organizations to obtain a more consistent and clearer perspective about compliance. It also works in providing different business organizations complete control over the accessibility of vital and sensitive information and data on their IT networks. It is a major help in restricting access especially to the most critical information. A lot of experts also define SAP GRC as the most recent addition to the series of effective processes, solutions and software that effectively run the business industry. One of the major objectives of SAP GRC is to efficiently help a business organization in implementing policies and controls that work in addressing all compliance obligations while also collecting information that are effective in proactively running a business. If implemented correctly, you can expect SAP GRC to work in creating a more effective central nervous system which can assist you in managing all the activities of your business in the most effective manner possible. It also allows you to obtain a more competitive edge because you will be able to clearly understand risks while also wisely choosing your opportunities. It also helps in monitoring the affairs of your business and your actions and raises alerts when risks appear. 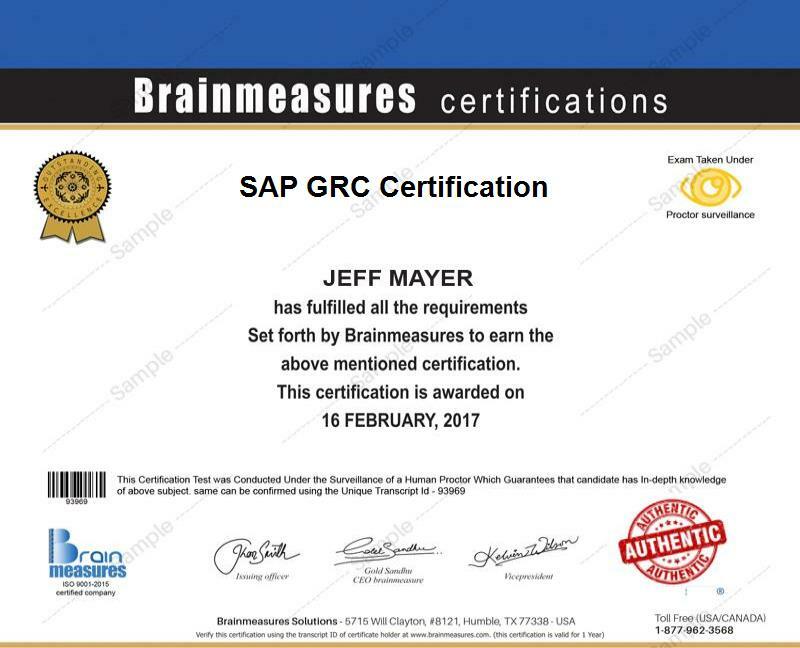 Enrolling in the SAP GRC certification course offered by Brainmeasures is your ticket towards fully understanding the whole SAP GRC scheme. Because of the proven reliability of this online certification company, you can expect its offered SAP GRC course to cover the most vital aspects associated to implementing the major SAP GRC processes. You can expect this online certification program to offer you the most comprehensive and reliable information about SAP GRC, the usual risks associated to running a business, the most effective governance that you can use to make your business formidable and complying to standards that are sure to keep your business stay on top. The SAP GRC certification course also allows you to access all information related to the major components of SAP GRC as well as the basics of its effective implementation. Holding a SAP GRC certificate which you can receive after completing the certification course is also a major help in effectively showing your skills and expertise in the area. How to take full advantage of implementing GRC? How to effectively manage and control risks and significantly reduce business costs? Enrolling in the SAP GRC certification program allows you to receive information and details that are sure to help you improve the performance of your business. This certification course is proven to be extremely beneficial to all individuals and professionals who are responsible in implementing standards, regulations and controls that are sure to lead a business organization to success. Your SAP GRC certification is also your ticket towards rewarding yourself with a higher level of salary. You can take full advantage of your SAP GRC certification to get the position of a SAP GRC systems engineer which allows you to enjoy a salary of around $92,000 to $135,000 per year. You can also use your certification to get the position of a SAP GRC consultant which usually offers an annual salary of around $105,000 to $144,000. Brainmeasures is an ISO 9001-2008 certified company, Brainmeasures is a leading online skill testing company. Our certifications are acknowledged by employers worldwide. Reason behind this trust is our world class testing standards. Brainmeasures offers skills tests in over 1200 varied fields and over 100 professionally developed courses and certification programs. Certification tests are developed by experienced professionals and subject matter experts. Each test goes under four rounds of proofreading to make it 100% error free. All tests developed are first taken by experts who judge its standards and then give their feedback. Tests are developed to check actual understanding of candidate’s knowledge of the subject and not mere on basis on difficulty level. While developing each test this fact is considered that what is the motive and purpose of testing. Each test developed checks complete knowledge of the test taker on that particular subject. Complete testing is so designed that a candidate has to finish the test within given time frame thus ruling out chances of using unfair means. Our Certifications determine the performance capability of an individual critical to the job. Minimum standard of achievement is set by subject matter experts All certifications are updated regularly to include latest additions to the field.